John Bunyan (November 28, 1628 – August 31, 1688), a Christian writer and preacher, was born at Harrowden (one mile south-east of Bedford, Bedfordshire), in the Parish of Elstow, England. As a preacher, John had the reputation of being able to inspire and stir the hearts of his listeners. He is the author of Pilgrim's Progress, arguably the most famous published Christian allegory. In addition to Pilgrim's Progress, Bunyan wrote nearly sixty titles, many of them expanded sermons. 2.2 "The City of Destruction"
Bunyan faced legal challenges to fulfilling his calling but did not compromise to authorities. He preferred to face and endure years of imprisonment at great sacrifice to himself and family, rather than resign himself to giving up preaching. He is identified with the Puritan tradition. Those not episcopally ordained as Church of England clergy were not legally recognized as ministers and so were unlicensed to preach. They faced possible imprisonment. Bunyon spent 12 years in prison. Bunyon saw few results in his own life-time in terms of large numbers of converts. However, he was convinced that faithfulness in God means that one leave results in God's hands, to produce them as God sees fit. John was born to Thomas Bunyan and his second wife, Margaret Bentley Bunyan. Thomas made a humble living as a tinker, repairing pots and kettles. Bunyan had little schooling beyond the basics of learning to read and write. He was known to be a very active, playful and rambunctious youth. When John was just sixteen, he suffered the loss of his mother. Bunyan's father, Thomas, soon remarried, estranging John from the home. He left home and enlisted in the army, serving in Oliver Cromwell's army at Newport Pagnell (1644-1647). Eventually, he followed his father into the Tarish Tinker's trade. In 1649, he married Mary, a pious young woman, raised in a godly way by her parents. Her only dowry appears to have been two books, Arthur Dent's Plain Man's Pathway to Heaven and Lewis Bayly's Practice of Piety. These writings pushed him towards a religious life. Mary's godly lifestyle also slowly influenced his conversion to Christianity. John and Mary had four children: Mary, Elizabeth, John, and Thomas. Mary, the eldest child, born in 1650, was blind from birth. The family lived in Elstow until 1655, when his wife died. Then John and the children moved to nearby Bedford. In his autobiographical book, Grace Abounding, Bunyan describes himself as having led an abandoned life in his youth. But there appears to be no evidence that he was, outwardly at any rate, worse than average. The only serious fault he specified was profanity. Bunyan also admitted to a love of dancing and ringing the church bell at odd times for amusement. The overwhelming power of his imagination led him to contemplate acts of impiety and profanity, including a vivid realization of the consequences involved. In particular, he was tormented by a curiosity about the "unpardonable sin," and a preoccupation that he had already committed it. He continually heard voices urging him to "sell Christ," and was tortured by fearful visions. After severe spiritual struggles, he escaped from this condition, and became an enthusiastic and assured believer. He was received into the Baptist church in Bedford by immersion in the Great Ouse River in 1653. In 1655, he became a deacon and began preaching, experiencing marked success from the start. Bunyan fiercely disagreed with the teachings of the Religious Society of Friends and took part in written debates during the years 1656-1657 with some of its leaders. First Bunyan published Some Gospel Truths Opened which attacked Quaker beliefs. The Quaker Edward Burrough responded with The True Faith of the Gospel of Peace. 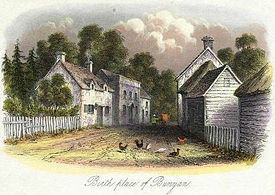 Bunyan countered Burrough's pamphlet with A Vindication of Some Gospel Truths Opened, which Burrough answered with Truth (the Strongest of All) Witnessed Forth. Later, the Quaker leader George Fox entered the verbal fray by publishing a refutation of Bunyan's essay in his The Great Mystery of the Great Whore Unfolded. In theology, Bunyan was a Puritan, but contrary to stereotypes, there was nothing gloomy or ascetic about him. The often reproduced portrait of Bunyan by his friend Robert White shows the attractiveness of his true character. He was tall, had reddish hair, a prominent nose, a rather large mouth, and sparkling eyes. With only grammar school formal education, John was no scholar, except of the English Bible. He knew scripture thoroughly. He was also influenced by Martin Luther's Commentary on the Epistle to the Galatians, in the 1575 translation. Bunyan took his second wife, Elizabeth, in 1659. She eventually bore him two more children, Sarah and Joseph. In 1658, Bunyan was indicted for preaching without a license. In spite of this, he continued to preach. He did not suffer imprisonment until November 1660, when he was taken to the county jail in Silver Street, Bedford. At first, he was confined for three months, leaving his new wife to care for their home and children. When he refused to conform and desist from preaching, his confinement was extended for a period of nearly 12 years with a short release of a few weeks in 1666. Over the years, his wife Elizabeth petitioned to the judges many times for his release. In January 1672, Charles II issued the Declaration of Religious Indulgence with the aim of making Roman Catholicism legal. 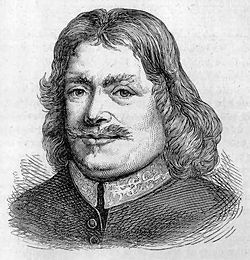 As a result, many religious prisoners were pardoned and released, including John Bunyan. That same month, he became pastor of the Bedford church. In March 1675, he was imprisoned for preaching again because Charles II withdrew the Declaration of Religious Indulgence. This time he was imprisoned in the Bedford town jail on the stone bridge over the Ouse. (The original warrant, discovered in 1887, is published in facsimile by Rush and Warwick, London). Six months later, he was freed. Because of his popularity, he was not arrested or imprisoned again. For the next thirteen years, he wrote and preached freely. He often reflected on how his calling meant hardship for his wife and family, especially during his years of imprisonment. One of his children was blind, whom he described as lying "nearer his heart" than anything else. During a trip to London, he caught a severe cold after being drenched. He later died as a result of a fever, at the house of a friend at Snow Hill, on August 31, 1688. 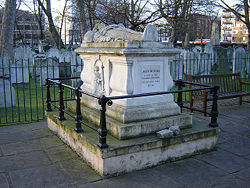 His grave lies in the cemetery at Bunhill Fields in London. Bunyan became a prolific author as well as a popular preacher, though most of his works consisted of expanded sermons. He wrote, The Pilgrim's Progress, in two parts, the first of which was published in London in 1678, and the second in 1684. He had begun the work in his first period of imprisonment, and probably finished it during the second. The earliest edition with the two parts combined in one volume was published in 1728. A third part, falsely attributed to Bunyan, appeared in 1693, and was reprinted as late as 1852. Its full title is The Pilgrim's Progress from This World to That Which Is to Come. The Pilgrim's Progress is arguably one of the most widely known allegories ever written. It has been extensively translated into other languages. Protestant missionaries commonly translated it as soon as translation of the Bible was completed. Two other successful works of Bunyan's are less well-known: The Life and Death of Mr. Badman (1680), an imaginary biography, and The Holy War (1682), an allegory. A third book which reveals Bunyan's inner life and his preparation for his appointed work is, Grace Abounding to the Chief of Sinners (1666). It is all about Bunyan's own spiritual path. His motive in writing "Grace Abounding" was to exalt the Christian concept of grace and to comfort those going through experiences similar to his own. The above works have appeared in numerous editions, and are accessible to all. There are several noteworthy collections of editions of The Pilgrim's Progress, for example, in the British Museum and in the New York Public Library, collected by the late James Lenox. Some time before his final release from prison Bunyan became involved in a controversy with Kiffin, Danvers, Deune, Paul, and others. In 1673, he published his Differences in Judgement about Water-Baptism no Bar to Communion. He took the stand that "the Church of Christ hath not warrant to keep out of the communion the Christian that is discovered to be a visible saint of the word, the Christian that walketh according to his own light with God." While he believed "water baptism to be God's ordinance," he refused to make "an idol of it". He thought those who refused fellowship and communion to those lacking a water baptism was idol making of a sort. He believed that Christians who walked the walk should take communion whether they had been baptized or not. Kiffin and Paul published a response in Serious Reflections (London, 1673), arguing in favor of the restriction of the Lord's Supper to baptized believers. They received the support of Henry Danvers in his Treatise of Baptism (London, 1673 or 1674). The controversy resulted in the Particular (Calvinistic) Baptists leaving the question of communion with the unbaptized open. Bunyan's church admitted pedobaptists to fellowship and finally became pedobaptist (Congregationalist). Bunyon today is claimed both by Baptists, many of whom practice open membership (that is, membership is open to all who declare faith in Christ whether baptized or not as a child or as an adult) and by Congregationalists. Bunyan has in The Pilgrim's Progress, the distinction of having written probably the most widely read book in the English language, and one which has been translated into more tongues than any book except the Bible. The charm of the work, which gives it wide appeal, lies in the interest of a story where the intense imagination of the writer makes characters, incidents, and scenes alive for his readers. Its touches of tenderness and quaint humor, its bursts of heart-moving eloquence, and its pure, idiomatic English create a sense that the scenes and stories are actually known and remembered by the reader. Macaulay has said about the book, "Every reader knows the straight and narrow path as well as he knows a road on which he has been backwards and forwards a hundred times." He adds that "In England during the latter half of the seventeenth century there were only two minds which possessed the imaginative faculty in a very eminent degree. One of these minds produced Paradise Lost, the other The Pilgrim's Progress." Bunyan wrote about 60 books and tracts, of which The Holy War ranks next to The Pilgrim's Progress in popularity, while Grace Abounding is one of the most interesting pieces of biography in existence. "The City of Destruction" was Bunyan's name for the world as under divine judgment. ↑ John Brown, John Bunyan (North Haven, CT: Archon Books, 1885; reprint, 1969), p 178. ↑ Charles H. Spurgeon, Pictures From Pilgrim’s Progress (Rio, Wis.: Ages Software, 1998-2001), 4. Wholesome words, Biography of John Bunyan. Retrieved January 25, 2008. Free audiobook of The Pilgrim's Progress from LibriVox. Acacia John Bunyan Online Library. Bunyan Baptist Church, Stevenage, UK. This page was last modified on 14 May 2018, at 20:27.